"Another warm and whimsical tale in this Fool's Gold series." Montana Hendrix finally found her niche in life. Her other two triplet sisters have always known what they wanted, but not Montana. Working with therapy dogs suits her quite well. As she and Fluffy, a Golden Retriever/Lab mix, are walking through town, a little boy attracts the dog's attention and Fluffy escapes from Montana. She chases him and catches up with him just in time to see him fly through the doors of the local hospital. Inside she finds overturned carts, chairs and one very angry doctor. Dr. Simon Bradley yells at Montana to take her dog and leave immediately. She hopes she has not jeopardized her job. Simon is a visiting surgeon who is helping burn victims, and one of his patients is not responding well to treatment. However, Kalinda's one response since arriving at the hospital is to ask about the dog that intruded that day. When Simon learns this, he contacts Montana's boss and asks about getting a dog to visit Kalinda. Perhaps this is what she needs to jump-start the healing process. Montana chooses a small poodle to bring to Kalinda. Of course, coming to the hospital means she will have to see Dr. Bradley again. This encounter proves to be somewhat different. There is an immediate physical chemistry between them; something so electrifying that Simon is shaken. He can't get Montana out of his mind. Simon doesn't do relationships. He travels from place to place, helping people heal and then moves on. Meanwhile, Montana is given the task, by Fool's Gold's mayor, of trying to get Simon to stay on at the hospital permanently. She certainly doesn't mind the task. The awful scars running up Simon's neck and onto his face don't deter Montana. He's an intriguing man she wants to get to know better and learn the story behind the scars. Situations keep placing Simon and Montana close to each other and soon they cannot deny the physical pull. A relationship that Simon does not want begins to bud. He makes his plans very clear to Montana, but she hopes to change his mind, and not just because the mayor asked her to do the town a favor. Will Simon accept Montana's gift of love, or will he continue to run? 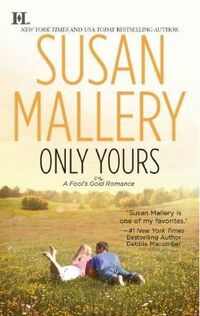 ONLY YOURS is the next installment in Susan Mallery's Fool's Gold series. Her characters are warm and delightful and the antics of these triplet sisters will have you smiling. This is a story about meeting your full potential and learning you are not defined by what you do, but by who you are inside. Don't miss this story or any of the Fool's Gold series. Can't wait for the next one later this year! Montana Hendrix has found her calling � working with therapy dogs. With a career she loves in a hometown she adores, she�s finally ready to look for her own happily ever after. Could one of her dogs help her find Mr. Right�or maybe Dr. Right? Surgeon Simon Bradley prefers the sterility of the hospital to the messiness of real life, especially when real life includes an accident-prone mutt and a woman whose kisses make him want what he knows he can�t have. Scarred since childhood, he avoids emotional entanglement by moving from place to place to heal children who need his skillful touch. Can his growing feelings for Montana lead him to find a home in Fool�s Gold, or will he walk away, taking her broken heart with him? Re: Another warm and whimsical tale in this Fool's Gold series. Great review! I really loved this book. I was kind of teasing when I told my hubs I'm going to post a review on amazon and its just going to be pink puffy hearts. This is my new favorite in the series. Another trip to Fool's Gold is just what I needed in a week with a lot of ups and downs in my personal life. It was nice to know that the book I was reading...Only Yours was going to be the Calgon Moment that would take me away from it all. When you read Only Yours it's hard to name a favorite moment, character, or scene...everything about Only Yours was true gold and not Fool's Gold!